Mist anytime, anywhere for an instant dewy glow. 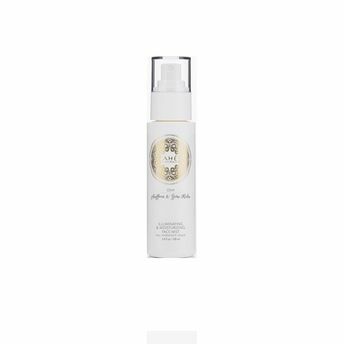 Specially formulated to soothe skin and nourish its layers for an instant radiant glow, Ahe Naturals Saffron & Gutu Kola Illuminating Face Mist is a potent Ayurvedic blend of Saffron, Gotu Kola, Papaya, Ashwagandha, Licorice, Melon and Aloe Vera. Dew is a lightweight facial mist, perfect for all skin types and weather conditions. It can be used by itself as a feather light moisturizing toner during warm/humid weather or can be layered underneath moisturiser as an illuminating toner during cold/dry weather. Additional Information: The products at Ahe Naturals are created on the outskirts of the historic city of Madurai, overlooking hills, coconut groves and stretches of natural beauty. An idyllic echo of centuries past. Their gardens are filled with Moringa, Noni, Pongamia, Neem and Aloe Vera, all organically grown, all used to infuse creams, salves, and oils.